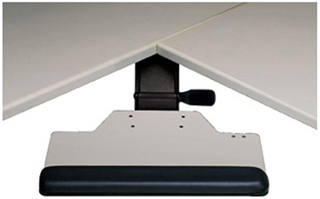 The Humanscale 600 Extender Keyboard Platform has been designed to ensure that users type and mouse within their Neutral Reach Zone creating a safe comfortable and sustainable work environment. Select the mechanism mouse platform mouse pads and other features to suit your particular needs. thin (1/4") composite that's non-toxic, durable and easy to clean. The 600 Extender Board fits neatly into a 90-degree or sharply radiused corner. Compatible with any of our mouse options. and to fit most desks.